What is it about the holiday time that makes us feel like we need to bake cookies and pies, and eat everything in sight?! Whatever the reason, it’s a great one because I love cookies and pies! This is our first holiday season eating on a keto diet so that means this is my first time making keto Christmas cookies. I wanted to keep it simple, but also make something a little different than your run of the mill Christmas cookies. That’s why I created these tasty Maple Macadamia Nut Cookies! These cookies originally started off as just maple cookies. I had made many attempts at cookies over the past 6 months with no success. I first tried coconut flour and quickly learned that the texture is not appetizing or cookie like.I moved onto almond flour and still had trouble with the ratios. 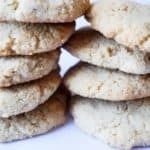 It wasn’t until a couple weeks ago that I was truly determined and planned on baking as many cookies as it took to create the perfect almond flour cookies. It must have been my lucky day because I made these cookies on first attempt! I was so excited for Matt to get home and try them. When Matt walked through the door the first thing I said was “I created the perfect cookie!” He loves coming home to anything new I’ve attempted to bake, even if it turns out horrible, so naturally, he grabbed one and bit into it. He looked to me with an excited look in his eye and said “What about Macadamia? !” I tried another and he couldn’t have been more right. His taste buds were on point! Macadamia nuts are steep in price, but I wanted to make them so I splurged. Not to worry, however, you can use any nut you have at home! We got a small container of them, re-made them with the nuts, and I created my favorite cookie of all time – Maple Macadamia Nut Cookies! Using hand mixer combine room temperature butter and erythritol. Add egg, vanilla, baking soda, and maple syrup and mix until combined well. Slowly add the almond flour as you mix. Once you have formed a dough fold in the macadamia nuts. Don't worry, the dough will be sticky. Place balls of dough onto a greased baking sheet and flatten out to desired cookie size. Bake in 350 degree oven for 12 minutes. Allow to cool for at least 20 minutes. Enjoy!